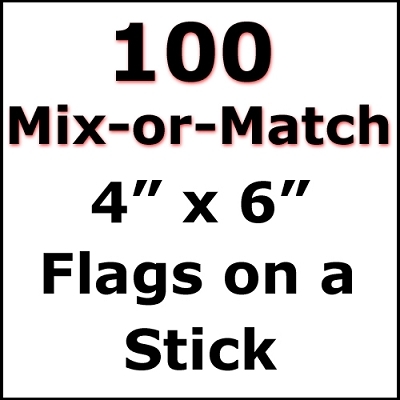 Select the flags you want for our Mix-or-Match Flags on a stick for SAVINGS! The quantity of 1 x $90 = 100 flags. Our 4x6 inch Rainbow Stick Flag is perfect for displaying on your desk or table, or for waving in a parade to show your national pride. THIS ITEM DOES NOT QUALIFY FOR ANY FURTHER DISCOUNTS OR COUPON OFFERS.